Paneer is loved in most forms at home by the kids. Be it for appetisers or for gravies, kids lap up the paneer dishes that's made about twice a month. Today's appetiser was much awaited by the elder one especially, so much so that she volunteered to buy the paneer from the store if it was going to be made that evening. Its a slightly lengthy wait, but totally worth it - that's the verdict and it sure is going to be on the dish rotation from the list of Paneer dishes already on the blog. In a bowl, add the ingredients of the marination and whisk well. 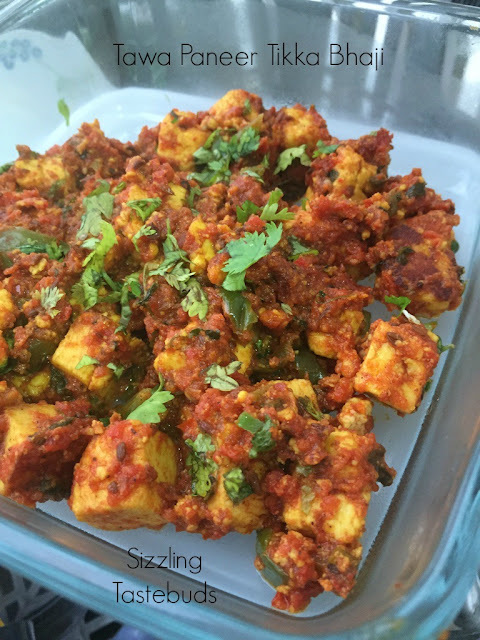 Add the paneer cubes , mix well taking care not to break the cubes. Cover and marinate for at least 1 hour, preferably in the refrigerator. On a tava / skillet, add 1 tsp of oil + butter , add the marinated paneer and saute them gently till slightly crispy (this will take about 8-9 min on very low flame). Keep them aside. In the same tava, add the remaining oil and splutter cumin seeds, add the bell peppers and saute them till slightly shriveled yet crunchy. Add the tomato puree, salt, dry spices and saute till oil separates from the gravy and it becomes slightly dry. Now add the sauteed paneer pieces and let it simmer on the tava till you get a dryish consistency. Top with chopped coriander leaves. This can be had as a yummy appetiser or as a side dish with Butter Kulcha / Naan. Look at all those paneer dishes you have on the blog! This is another good one to the list. Love tawa masala paneer recipe.. its goes perfect with rumali roti.. awesome flavors. 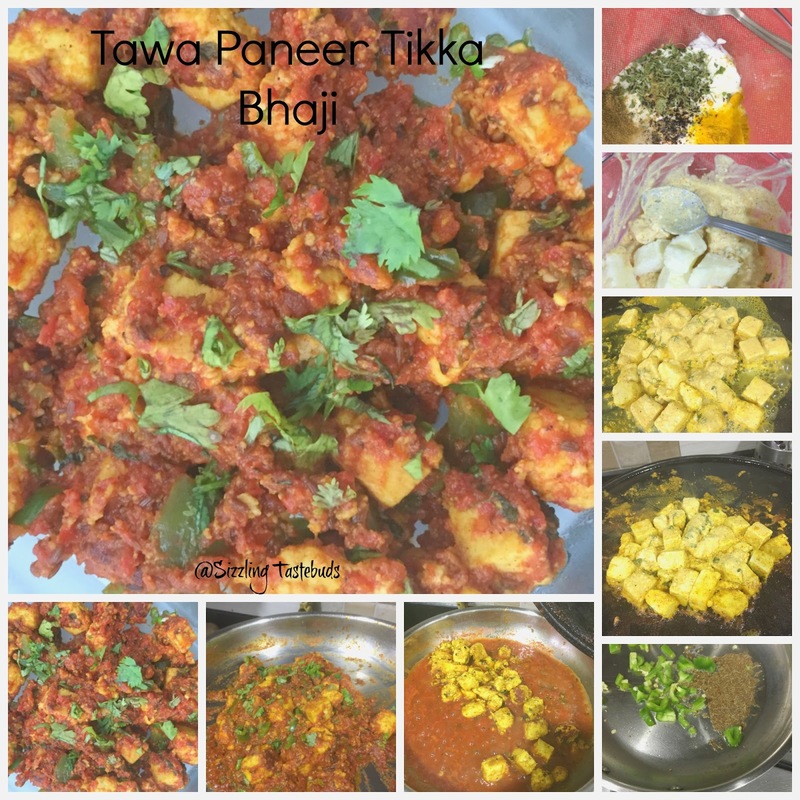 I guess we can have 100 different paneer dishes, our kids will still it love it more..I like this version of tikka you have Kalyani..very nicely done. That is such an inviting and delicious looking paneer dish Kalyani. I know my family will love it. Love your list of Paneer Recipes. Liked your marination list. This will taste great with nan definitely. Slurp slurp, i want a plate of this super irresistible paneer tikka rite now, such a delicious version Kalyani. Tempting to the core. Kids sure know how to get the things done if they need something ASAP!! You have a great repertoire of paneer dishes. Will come back to check on those too as paneer is loved by all at home. The tawa paneer tikka looks mouth watering and I am literally drooling over it. This Jain style Paneer Tikka looks absolutely delicious. The marinade has coated very well.